Disclosure: I participated in a Blogger Activation on behalf of Mom Central Consulting (#MC) for Kidoodle.TV. I received a promotional item and a free trial as a thank you for participating. I have been using Kidoodle.TV with the girls since it began Beta testing in September, and have enjoyed the experience. It is nice to see new shows being added, as well as trying out the different features included a "Parents Room" where you can monitor what your child is viewing, as well as the parental controls, where you can filter the shows don't want your children to watch based on their age. With Kidoodle.TV you don't have to worry about having to pre-screen all the shows, as they offer age appropriate content that is not only entertaining but offers educational benefits as well. Parents will appreciate this and children will enjoy the great content Kidoodle.TV is available to offer from a variety of sources. In addition, "Kidoodle.TV offers the freedom and diversity of Internet access but with parameters built in to assist with child safety." Once you log in to Kidoodle.TV, you will be able to select from the up to 5 kid profiles you have set up for your family. Then, you can leave it up to your child to what they want to watch. No more having kids fights over who gets to watch what and when. My kids love the fact that each of the shows are free of advertisements, so that they can enjoy their shows without interruption. I don't know about you, but with my toddlers, they don't have patience when it comes to commercials, and are always fussing when one comes on, as they want their program back. With Kidoodle.TV I don't have to worry about this, which I love! And, I don't have to worry about them seeing toy commercials and begging me to buy them the toy they saw and have to have. We tried giving up cable in our house, but ended up putting it back on as we were all going stir crazy, and missing our favorite episodes. I used to love sitting with the girls in the AM and watching their educational shows and then talking about what they learned. In place of cable, we were utilizing other online content platforms, but were never fully satisfied with what they had to offer, especially for kids. Either the content was not age-appropriate or it was hard to navigate through, and not one you would want to leave your little ones to navigate on their own. And, the pop up ads always drove us crazy. I would log in to the computer later in the day to find new spam programs were added a result of trying to click off of these pop up ads. And, the services would make my computer slower and crash without warning. Not fun, especially when you have little ones who are getting into a show, and then have the screen go black. But, like I said, I have been using Kidoodle.TV since its beta testing began in September, and have not run into any problems as of yet. And, when you are on the go, you can also download the mobile app for Kidoodle.TV to keep kids entertained wherever you are. This app has come in handy recently when we were driving to visit relatives for Thanksgiving, running errands or going to the doctor's office with the kids. I could simply pull out my phone and choose my child's profile, and they were ready to be entertained, as we passed the time. No more "Are we there yet" or "Are we almost done." Instead, I have the girls asking me "Please, just one more show" as the timer goes off letting me know that they have watched their allotted viewing time. The timer is a great feature to have, as I have been so so frazzled and lost track of time, only to find that the girls went over their 1 hour of television time in a given day. Now, I don't have to worry, as the Kidoodle.TV timer feature will let me know. So, if you like fun online content platforms, that are geared towards your child, and that will provide not only entertaining but educational content, that you as a parent can control, then you will wan to check out Kidoodle.TV television. 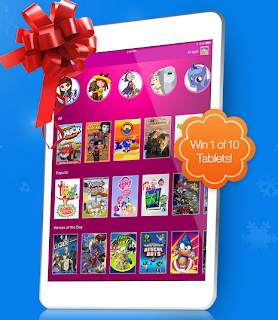 Right now you can enjoy Kidoodle.TV FREE without the need to input a credit card, during the month of December. This is a great way to try out this service and see if it is right for your family. I know that once you try it out, that you will see why my family and so many others can't stop raving about Kidoodle.TV. Click here now to visit Kidoodle.TV, to take advantage of the FREE trial service for the remainder of December -- https://www.kidoodle.tv/. And, don't forget to add the Kidoodle.TV app to your phone or tablet, so that you can take this amazing kid-friendly content platform with you wherever you go this holiday season. It will definitely be a life saver for us in the car on the long drive to visit relatives, or if the kids get bored waiting for us to leave places. Stay in the know on special offers, giveaways and new programming additions by following Kidoodle.TV on Twitter and Facebook today. Just for signing up for the FREE December trial service at Kidoodle.TV, you will be entered to win 1 of 10 tablets or 1 of 10 Kidoodle.TV year-long subscriptions! Note, you have until Dec. 31st to sign up, for your chance to win. And, once the December trial period is over, you can log in and provide your credit card information to keep the service going on a monthly basis. I have never heard of this before thanks for sharing it sounds really interesting.